When people say, “Tell me about the Knott Foundation,” I often answer that we are a Catholic family foundation with a capital F-A-M-I-L-Y. The Knott family is 250 members strong – all direct descendants of our founders, and spouses of those descendants. Thirty-four of those members have gone through our rigorous training program and now sit on the Knott Foundation’s Board of Trustees. Two more members are going through our training program right now. Together, our Trustees represent the second, third, and fourth generations of Marion and Henry Knott’s lineage, and 9 discrete family branches from the Knotts’ original 13 children. I learned in a webinar recently that most family foundations don’t make it past the third generation. Perhaps the foundation is unable to attract younger family members, or perhaps differing viewpoints piece the philanthropy into multiple vehicles, each with its own set of priorities. Nevertheless, the foundation ceases to exist in its original form. The Knott Foundation bucks this trend. Last year we added four younger family members to our Board of Trustees and elected the largest Board in the Foundation’s history. Spring is a season for growth and renewal. In that vein, I am happy to reflect on the continued growth and vibrancy the Knott family brings to our work as a philanthropic venture dedicated to strengthening communities in central and western Maryland. Truly, we are a Catholic family foundation with a capital F-A-M-I-L-Y! I am pleased to announce the publication of our 2018 annual report. 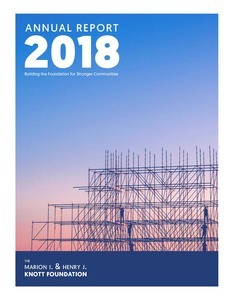 “Building the Foundation for Stronger Communities” is the theme of our 2018 annual report. Through this theme, we embrace our dual purpose to strengthen the community and nurture and sustain family unity. We also mark a significant milestone, having recently elected the largest Board in the history of the Foundation – 34 family members dedicated to our legacy and work. I hope you enjoy reading our 2018 annual report and learning more about the Knott Foundation’s mission to strengthen the community. We are pleased to announce that 12 organizations received over $750,000 in our February grant cycle. Kids need committed and caring adults to help them navigate life. Out-of-school time programs are a great avenue to build those relationships and help them realize their full potential. Yet an increasing number of low-income students are on the sidelines, and older youth in particular (those in middle and high school) often face the most complex barriers to participation. In our research and conversations with field experts, we learned a growing body of evidence suggests that a consistent relationship with a caring adult is the single most important ingredient to increasing the likelihood that a young person will flourish and become a productive adult. Through our BOOST initiative, we would like to see organizations demonstrate significant depth, duration, and reach of informal and formal mentoring relationships between older youth and caring adults. 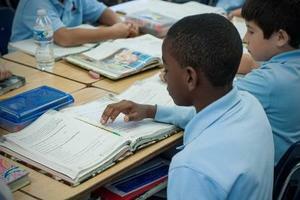 With those measures, research says in the long-term these youth will experience improved educational outcomes and labor market success, improved decision-making capabilities, and beneficial effects on a number of other well-being variables – all of which point to our founders’ deep-seated value of education, opportunity, and hard work. This year we are pleased to announce our third round of BOOST initiative grants, totaling $233,000 to two organizations in Baltimore. BOOST is a 5-year, $1 million initiative. Participation in our BOOST initiative is by invitation only. We look forward to sharing what we learn from this initiative over time. For a complete description of the program, please visit our BOOST initiative webpage. And to read more about the Foundation’s journey to develop the BOOST initiative, click here. We are pleased to announce that 19 organizations received over $860,000 in our October grant cycle. 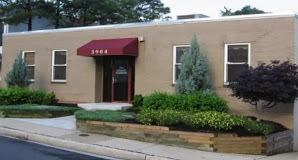 Our Board of Trustees has awarded a $1 million grant to the Archdiocese of Baltimore, payable over three years, for the construction of a new Catholic school on the westside of Baltimore City. This marks the first new school the Archdiocese has built in Baltimore in 57 years. The school will serve students in grades pre-K – 8 and will advance the educational mission of the Church to provide young people a pathway to a better life grounded in virtue and faith. Our founders, Marion and Henry Knott, were devout Catholics, and the Foundation has honored their faith by prioritizing our giving to Catholic organizations, including schools. In the past five years, the Foundation has awarded approximately $4.5 million to more than 55 independent and archdiocesan Catholic schools. We are pleased to announce that 14 organizations received over $850,000 in our June grant cycle. I am pleased to announce the publication of our 2017 annual report. 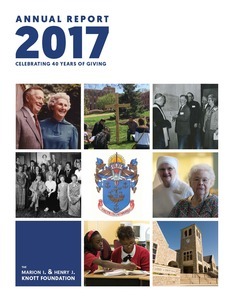 Our 2017 annual report celebrates the Knott Foundation’s 40th anniversary year, marking four decades of giving to organizations strengthening communities in the Archdiocese of Baltimore. To commemorate this milestone, we also released a short film last year about the history and mission of the Foundation. You can watch it here. I hope you enjoy reading our 2017 annual report and learning more about the Knott Foundation’s mission to strengthen the community. We are pleased to announce that 10 organizations received over $750,000 in our February grant cycle. This year we are pleased to announce our second round of BOOST initiative grants, totaling $198,000 to two organizations in Baltimore. BOOST is a 5-year, $1 million initiative. Participation is by invitation only. We look forward to sharing what we learn from this initiative over time. We are pleased to announce that 12 organizations received over $900,000 in our October grant cycle. We are pleased to announce that 14 organizations received over $800,000 in our June 2017 grant cycle. We are pleased to release a short film showcasing the history and mission of the Marion I. & Henry J. Knott Foundation. After four decades of grantmaking in the Archdiocese of Baltimore, we wanted to tell the story of who our founders were, why they created the Foundation, how multiple generations of the Knott family are involved in our work today, and how our founders’ vision and legacy continues to strengthen the community in and around Baltimore. Click here to watch the 6-minute film, or visit our homepage and click on the photo of Marion and Henry. We would like to thank all of the people who participated in the making of this film, including our grantees Caroline Center, St. Elizabeth School, and St. Francis Neighborhood Center, as well as Archbishop William Lori, Fr. Robert Leavitt, Peter Angelos, and members of the Knott family. It is an honor to steward the legacy of Marion and Henry Knott, and to share our story with you. We are pleased to announce that 16 organizations received over $700,000 in our February 2017 grant cycle. For a complete listing of our grant awards, please visit our past awards database. Our founders believed that education was the key to success, and that hard work combined with access to the right opportunities opened doors for people to become leaders in their communities. Our Building Opportunities in Out-of-School Time (BOOST) initiative is an extension of this donor intent and seeks to build opportunities in out-of-school time hours for older disadvantaged youth in Baltimore. This year we are pleased to announce our first round of BOOST initiative grants, totaling $355,000 to four organizations in Baltimore. Announcing our most recent grant recipients in Catholic activities, education and human services. We are pleased to announce that 14 organizations received nearly $650,000 in our October grant cycle. Announcing our most recent grant recipients in arts & humanities, education and human services. We are pleased to announce that 10 organizations received over $650,000 in our June 2016 grant cycle. For a complete listing of our grant awards from previous cycles, please visit our past awards database. Transparency, in a nutshell, is about openness and accountability. To operate transparently, I believe our foundation must provide the broader community with relevant and timely information about our work, our operations and processes, and what we’re learning. A valuable byproduct of this sharing is that it opens the floor for discussion and participation from our stakeholders, promoting our own accountability to the community. Having been in the grantseeker role myself, I understand that people might be curious about what’s happening “behind the scenes” in our office (or any private foundation for that matter). While there’s a lot of information on our website, and we’re always happy to talk over the phone, there may still be some big, unanswered questions. For example: When and how do we reflect on our work? What strategic thinking have we been doing over the past few years? How is the Knott family involved in our grantmaking process, and how do their professional and personal experiences help inform their work? And what exactly happens to that letter of inquiry, grant proposal, or post grant report that you write once it’s submitted? Part I (this post) recaps our strategic journey over the past three years to share our donor intent and legacy, explore our own talents and resources, and create a common education base around community needs and conditions. Part II will examine what happens behind the scenes with grant applications – from the time a letter of inquiry comes in the door to when a final grant report is submitted. To begin, we’ve spent the last three years reflecting on three important components of our work: our donor intent and legacy, our foundation talents and resources, and our community needs and conditions. All of these components play a role in guiding our strategic direction as a Catholic family foundation in the Archdiocese of Baltimore. One way of positioning donor intent is through three basic, formative questions I believe all foundations must answer about their giving: why, what, and how. Donor intent is the why. It illustrates the values that motivated our founders to give back in the ways that they did. In the words of business writers Jim Collins and Jerry Porras, “It is more important to know who you are than where you are going, for where you are going will change as the world around you changes” (Building Your Company’s Vision, Harvard Business Review, 1996). For a family foundation like ours, donor intent is that identity, that stable force in an ever-changing world, which Collins and Porras allude to. In 2014, after researching our donor intent and discussing it at a foundation retreat, we decided to share more about the legacy of our founders through the program pages on our website. 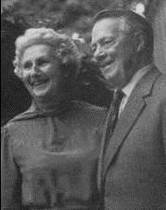 There, you can find information about why Mr. and Mrs. Knott cared so deeply about supporting communities in the Archdiocese of Baltimore through giving to education, human services, health care, arts and humanities, and the Catholic Church. The values embodied in these stories are the guiding force behind our role as grantmakers entrusted with honoring the legacy of our founders. Yet even with a shared understanding of our donor intent, it’s worth noting that our board looks very different today than it did when Mr. and Mrs. Knott established the Foundation 39 years ago. Twenty-nine Knott family members serve as trustees, representing three generations of the Knott family – the children, grandchildren, and great-grandchildren of Marion and Henry Knott. With this many voices in the boardroom, it has been important for us to understand and reflect on our own talents and resources as a grantmaking foundation, and to be mindful in how we approach our work. We do this by taking a global view of our grantmaking – evaluating application and award statistics by each program area, for instance – as well as discussing our own tolerance for risk, expectations for results, passion for our work, and capabilities as a small-staffed foundation. Another important piece of the strategy puzzle for family foundations is external in nature – it’s all about community needs and conditions. Last year I had the opportunity to formally consult with more than 25 high-level experts representing all sectors of our giving – executive directors, school principals, researchers, program staff, national advocates, and other grantmakers. These practitioners painted a picture of some of the key challenges facing our community and pointed us to important resources to further our learning. The Knott Foundation's board examined these findings at a retreat, spending time discussing the landscape of our ever-changing community, reflecting on our own giving, and determining how best to advance our mission to strengthen the community within the panoply of pressing needs that exist now. So what do these three components have in common? They all intersect to help us manage our own strategic direction as a foundation. Our founders saw a whole community of needs, which is reflected today in our broad programmatic focus and open application process. 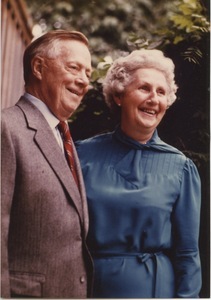 At the same time, Mr. and Mrs. Knott were steadfast in their dedication to education and the Catholic faith; they saw the Church as an anchor institution poised to address a wide spectrum of societal needs. Therefore, within our five program areas we continue to prioritize education and Catholic organizations because they were of central importance to our founders and remain important to both our current board and the Maryland community. Next year, we’ll also initiate a small-scale, proactive funding portfolio in the out-of-school time space. This portfolio will focus on helping disadvantaged older youth in Baltimore City, especially through informal and formal mentoring relationships between youth and caring adults. I look forward to sharing more about this initiative and what we learn from it over time. Ultimately our goal is to steward the resources entrusted to us by honoring the intent of our original donors, accommodating the preferences of our current board, and responding to the conditions of the present community. In this way, we remain true to our roots as a family foundation seeking to strengthen the community here in Maryland. We are pleased to announce that 18 organizations received over $700,000 in our February 2016 grant cycle. 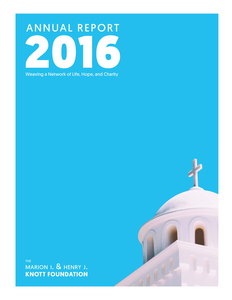 I am pleased to announce the publication of our 2015 annual report. Last year painted a dichotomous picture of our community. On the one hand, we observed the noble ministry of nonprofits working tirelessly to help meet the spiritual, educational, social, and cultural needs of people all across Maryland. On the other hand, we also witnessed unrest in the wake of Freddie Gray’s death that plainly exposed the many structural inequities facing our city. “Under One Roof” is the theme of our 2015 annual report. Through this theme we express optimism in our potential to bring people living in the Archdiocese of Baltimore closer in communion with one another, and to promote opportunity for all people. I hope you enjoy reading our 2015 annual report and learning more about the Knott Foundation’s legacy as well as the many inspiring stories behind the grants that we award. The February 2016 Catholic Review magazine features an article by Mary K. Tilghman that explores how our grants to Catholic schools improve students’ lives. Education is our largest program area, and we’re proud to have awarded over $4 million to Catholic schools in the Archdiocese of Baltimore over the last five years. In 2015 alone, we awarded just over $1 million to Catholic schools, which equates to approximately 45% of our aggregate grantmaking distributions that year. Beyond these numbers, however, is a story at each and every school illustrating how students are benefiting from the “whole package” that Catholic education offers: the character development it nurtures in students; the moral stability it provides to the community; the motivation it provides to students who are excelling academically; and the doors it opens for students who may have limited access to opportunity. Our founders believed that education was the key to success, and that hard work combined with access to a quality education was the foundation from which all people could become active citizens, ready to give back and become leaders in their communities. We thank the Catholic Review for highlighting our work in this area, and we hope you enjoy reading the article yourself. We are pleased to announce that 14 organizations received over $700,000 in our October 2015 grant cycle. We are pleased to announce that 13 organizations received over $700,000 in our June 2015 grant cycle. It is my pleasure to announce the publication of our 2014 annual report! In 2014, we came together to explore and formalize the values and principles behind our founders’ generosity to people and organizations in the Archdiocese of Baltimore. Consequently, in addition to stories about the impact of our grant awards, our 2014 annual report features short narratives about Henry and Marion Knott and how they lived their lives. These narratives and the values that they stand for inform our work as a Catholic family foundation committed to nurturing family unity and strengthening the community. On a more personal note, I would like to remark on the passing of our beloved trustee, Alice Voelkel, at the end of last year. 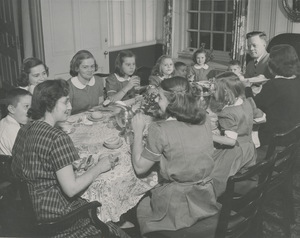 Alice was the third of Henry and Marion Knott’s 13 children. She was a past president of the Knott Foundation and a charter trustee, serving for 37 years on our board. She will be dearly missed. 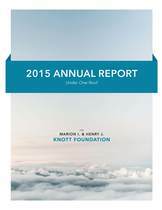 I hope you enjoy reading our 2014 annual report and learning more about the Knott Foundation’s story and the many wonderful stories behind the grants that we award. We are pleased to announce that 14 organizations received over $700,000 in our February 2015 grant cycle. Financial uncertainty is more common than not in the nonprofit world. One estimate says that approximately one-third of all nonprofits operate in a constant state of financial distress (Mattocks, Zone of Insolvency, 2008). For others, financial distress can come at a moment’s notice. A late grant payment, a pending insurance claim for a major repair, or a lackluster fundraiser can make it difficult for organizations to make ends meet in any given month. The Knott Foundation can serve as a source of help. In 2003, we began offering cash flow loans to qualifying nonprofits that meet our eligibility guidelines. In brief, we have the ability to provide short-term loans of $10,000-$25,000 with favorable rates and a quick turnaround time to nonprofits experiencing delayed receivables. You can learn more about the cash flow loan program and how to apply on our website. Over the last 12 years, we’ve awarded 38 loans totaling $739,500. As of the date of this posting, all of the funds have been paid back to the Foundation. Many organizations have benefited and, while the number of loans awarded each year reached its peak in 2008, we continue to respond to inquiries and accept applications. A few years ago we highlighted a story about one of our cash flow loan recipients and their journey with fundraising after undergoing a leadership transition. That story is just one example of how an organization experiencing unforeseen financial distress can benefit from a small loan to bridge a critical moment in time. Cash flow loans are just one tool that we’ve been able to use to help make a difference in the day-to-day operations of the nonprofits we support. If you are interested in learning more about the program or applying for a loan, please take a moment to review our website or call our office. We are pleased to announce that 15 organizations received over $700,000 in our October 2014 grant cycle. We are pleased to announce that 12 organizations received over $700,000 in our June 2014 grant cycle. In life, we often meet someone who demonstrates a special quality that you cannot really describe. They exude an energy that you know will carry them far. We at the Knott Foundation met one such individual when Mr. Chae Aaron Harris walked through our doors in 2010. Chae came to us through Cristo Rey Jesuit High School’s Corporate Internship Program, a unique funding model whereby students contribute to the cost of their education through work partnerships with local employers. Through this program, Chae was a member of the Knott Foundation team for two years. It’s hard to believe that Chae graduated from high school this past weekend. Yet it is exciting to watch him enter another stage of his life. Chae applied to six colleges and was accepted to the Community College of Baltimore County. He is still awaiting news from several other schools. Wherever he lands, he plans to major in music. This summer, Chae will be working two jobs in order to help with college expenses. While Chae gained worthwhile work experience during his time with us, we benefitted as well by seeing his tenacity, curiosity and talents grow. We also saw first-hand how opening doors of opportunity for talented, faith-filled students like those at Cristo Rey helps to create a stronger, more vibrant community. We are so proud of Chae and all of the other Class of 2014 graduates who are starting their next journey, and we remain thankful for everyone who has helped them along the way. It is my pleasure to announce the publication of our 2013 Annual Report! By weaving together outcomes from grants in our five program areas, our annual report paints a broader picture of the impact the Knott Foundation and our grantees are having on people and communities in the Archdiocese of Baltimore. I hope you enjoy this publication and the many wonderful stories behind the grants that we award. We are pleased to announce that 19 organizations received over $700,000 in our February 2014 grant cycle. Oftentimes my favorite part of a publication is the “by the numbers” section. (I can’t seem to resist a cleanly presented package of numbers that tells a bigger story!) So, I thought it would be interesting and useful to present a few facts and figures about the Knott Foundation, our giving, and the family’s historic legacy. As a premier Catholic family foundation in Maryland, we have the dual purpose to strengthen our community in the Archdiocese of Baltimore and promote family unity. With this mission in mind, we look forward to expanding these numbers in the future and continuing to tell our story for many years to come. In refining the design, we’ve also expanded our communications mission: Our aim is to paint a vivid picture of who we are and share in real-time what we’re learning. As such, one of the new features on our website is a blog where we’ll post foundation news, spotlight stories about our grantees, and our key learnings from the field. We’ve also incorporated an embedded search function on the site and built program pages to showcase our giving in our five program areas: arts and humanities, Catholic activities, education, health care, and human services. If you have any feedback about our new website, please send it to knott@knottfoundation.org. We would add that our new website is best viewed in the most recent version of popular web browsers (Internet Explorer version 10 or above, Firefox, and Google Chrome). We look forward to staying in touch via our e-newsletter. In the meantime, please accept our warm wishes for a safe, healthy, and prosperous new year! On behalf of the Board of Trustees of the Marion I. & Henry J. Knott Foundation, I am delighted to announce the appointment of our new Executive Director, Kelly Medinger. Many of you know Kelly from her former role as our Program and Communications Associate. Joining the Foundation in March 2011, she excelled in her work, and in our evaluation, exhibited competency and strength beyond that position. As Executive Director, her new responsibilities include managing the general operations of the Foundation, supporting board membership and development, overseeing our grantmaking efforts, and guiding and carrying out our strategic direction. Since graduating with honors from the University of Notre Dame in Notre Dame, Indiana, Kelly's career in the philanthropic giving arena has spanned 12 years. Prior to joining the Foundation, she served as a Program Officer at The Goizueta Foundation in Atlanta, a private family foundation with Catholic roots. Upon moving to Baltimore in 2007, she became the Director of Corporate, Foundation and Government Relations at Stevenson University. You can learn more about Kelly by clicking here. Kelly's appointment comes at an important time for the Knott Foundation. This past year we celebrated 35 years of grantmaking. With three generations and 30 family members on our Board, we are confident that Kelly will serve the Foundation, the Knott family, and the Maryland nonprofit community with enthusiasm and thoughtfulness - as we have learned is her way. "It is an honor and a privilege to be selected for this role," shared Kelly. "And I very much look forward to working with our trustees, grantees, fellow funders, and community leaders to help carry out the mission of the Foundation and the inspiring legacy of our founders, Marion I. and Henry J. Knott." Alongside our Board of Trustees and our dedicated professional staff, Carol and Kathleen, we invite you to extend a warm welcome to Kelly in her new role. We are extremely grateful to have her talent and leadership at the Knott Foundation. Thank you for all that you do to support our community, and please accept our best wishes for a joyous and successful new year.